As always, my focus here as always is to identify the best value for money 'brand name' replicas, as well as where to find them at the best prices on the internet. 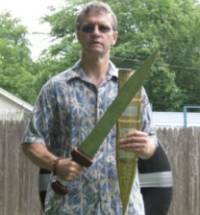 But unless we can get some idea of how the first ancient swords evolved, what they actually looked like, and how they were used by the early societies of the Egyptians, Greeks, Celts and Romans - trying to determine the individual merits of a particular replica is going to be an exercise in futility. 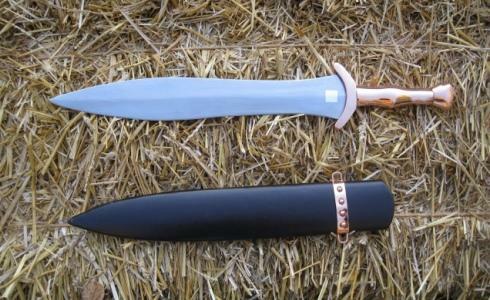 The predecessors of the very first ancient swords were basically pressure flaked flint and obsidian daggers - and let's be honest, we aren't going to find too many replicas of these for sale..
Later, came the first copper 'swords' of the Middle East and the Mediterranean, which were again in effect nothing more than long daggers. Unfortunately, there aren't any ready made production replicas of these particular ancient swords available in our price range. 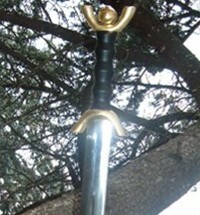 BUT if you really want a replica of one of these ancient swords, I recommend a visit to www.bronze-age-craft.com, Neil Burridges UK based website. 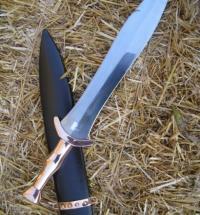 So it seems that the first production swords in our price range begin with the Ancient swords of the Egyptians. The Egyptians actually made very little use of swords until the Iron age, but even then preferred to use them only as a back-up weapon to their bows, spears and axes. The most notable exception was the Bronze Canaanite Sickle Sword, or Khopesh, which traces its origins to Sumeria around the third millennium BC. 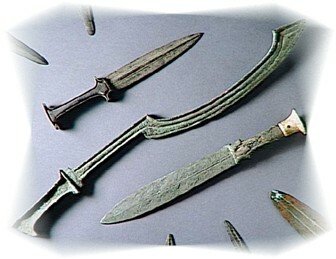 While originally these ancient swords were used against the Egyptians, they were so impressed by them that they adopted them as their own and the Khopesh eventually became the very symbol of Egyptian authority, with two such swords even found in the tomb of the legendary Pharaoh/Mummy Tutankhamen (c 1350 BC). Unfortunately for us collectors, there are very few replicas of these ancient swords on the market - and almost none of the functional ones are in our price range - except for a couple by Deepeeka of India. The Hoplite sword was the sidearm of the heavily armed Greek foot soldier of the classical period - similar to the slightly shorter, more durable swords of their even more militant neighbors, the Spartans. The ancient swords of the Greek Hoplites were made of roughly forged steel, with a waist-ed, leaf shaped double edged blade around 24" long. The tang of these swords was a flat cross section of the hilt, bound on both sides by bone or wood and then covered with a thin sheet of metal. Like the Egyptians, the Greek Hoplite sword was more of a back up weapon, with the leaf shaped blade used to slash and cut at their foes once the primary Hoplite spear had been broken, dropped or thrown. 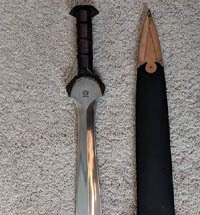 The most commonly available replica in our price range is undoubtedly the Classic Hoplite Sword (pictured right) made by Windlass Steelcrafts of India. In most respects, this is actually quite an accurate replica of these ancient swords, though it does fall down in the extremely contemporary construction of the hilt. 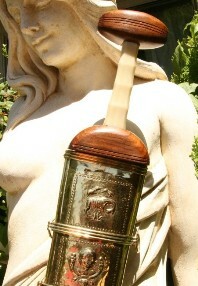 Despite this however, all reports to date are that it is very nicely constructed, sturdy and handles exceptionally well. The ancient swords of the 'Barbarian' Celts (circa 700-600BC) were essentially variants of Bronze age swords, only longer and heavier. Obviously, such designs are purely contemporary, and would cause considerable confusion to a Celtic Cheiftan who happened to stumble upon one deep in an ancient Druidic forest grove...! 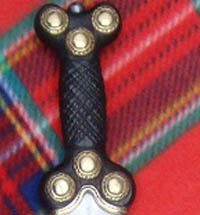 The majority of these Celtic swords are wall hangers or poorly constructed and very cheap 'functional' swords with thin tangs and poorly forged blades. However, below are some that are all really quite good in their own way, the first two being quite historically accurate and the last - the best made example of the historical hybrid leaf blade with anthropomorphic hilt.. 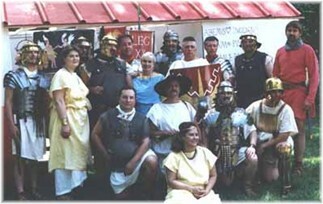 Believed to have been adopted by the Romans from Spanish Mercenaries during the first Punic War, the Roman Gladius became the standard issue infantry weapon of the Roman legions. As such, the Gladius was destined to become the sword that conquered the world, and it saw service in the Roman armies for at least 250 years. 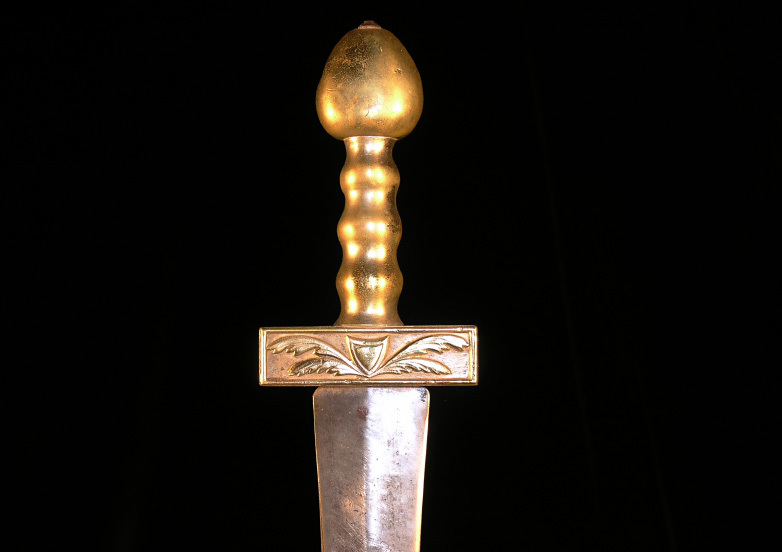 Fully capable of piercing a mail shirt, the Gladius was a short, double edged stabbing sword around 20-24" long and 2" wide with a grip with four ridges to fit the fingers and a characteristic bulbous pommel. While these ancient swords themselves were typically quite simple, the wooden, leather covered scabbards were anything but - with lavish ornamentation and a distinctive 4 ring suspension system. Despite the fact that there are more replicas of Roman swords than any other ancient swords on the market, getting an accurate replica of a Roman Gladius is no easy task. 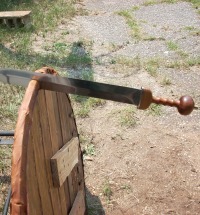 If you ask Matthew Amt from his LARP (live action role playing) website he'll tell you that most modern production replicas simply don't cut the mustard and need a fair amount of modification to bring them into line with the historical originals. 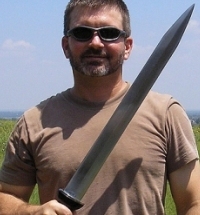 Interestingly, Matthew also notes that "modern reproduction gladii are generally made of better steel than their ancient counterparts, and finished to a much more exacting degree." Generally speaking, those in the know recommend that the best production Roman swords available on a budget that pay more than mere lip service to historical accuracy are produced by Deepeeka of India (pictured right). While their swords are as far from perfect, they are the closest to the originals of any production pieces, though tend to be rather poorly balanced. 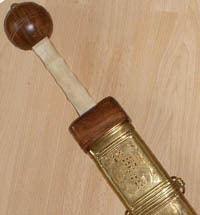 Windlass Steelcrafts also makes some reasonable facsimiles, such as the earlier Mainz-Pattern Gladius and the later Pompeii Gladius. While these swords may not be as close to the originals as those produced by Deepeeka, they are on the whole better balanced and made from higher quality, properly heat treated steel. 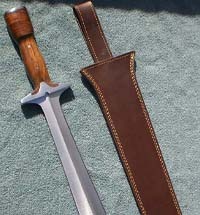 Kris Cutlery Roman Gladius: A very well made and extremely sturdy replica that was discontinued when Kris Cutlery switched suppliers from the Philippines to primarily importing from China..
Kris Cutlery Celtic Sword: Another one from the Philippines that was discontinued when Kris changed to primarily getting their swords in from China. 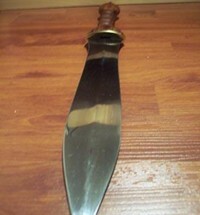 And a sword that will be sorely missed - with a 5 star rating and all.. sob.. There are also several very good books that I suggest you read, including my favourite which features a timeline of swords from ancient times to the present Swords and Hilt Weapons by Michael D. Coe, et, al. I used this book when researching some of the more obscure facts presented in this article and highly recommend it to anyone with an interest in swords, ancient and otherwise. I hope this information on Ancient swords has been helpful. 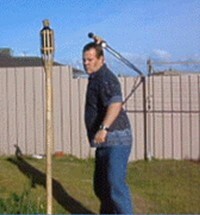 To return to sword-buyers-guide Homepage from Modern Replicas of Ancient Swords, click here.